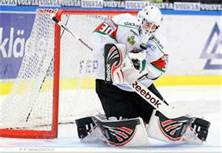 Linus Ullmark stopped 44 of 45 shots sent his way Sunday as Modo J20 earned a 2-1 overtime win over Skelleftea J20. The 6'3" Ullmark came up big throughout, including many big saves as Gustav Possler (’13) served a five-minute major for a check to the head late in the game. MODO opens the SuperElit regular season schedule Saturday when they hosy Brynas. In the OHL, Dan Catenacci's Owen Sound Attack throttled Erie 9-4 in their second-to-last preseason contest. The Attack will close out their exhibition schedule Tuesday with a game against Mississauga. Catenacci sustained an undisclosed injury and did not play. Alex Lepkowski's Barrie Colts defeated Kitchener, 5-2. The Colts close out the preseason Friday with a rematch against the Rangers. Do you know which ECHL team the Sabres will be affiliated with this year? It is unclear at this time but I'm certain they will find an affiliate to use. I still like the Elmira idea to at least get that third minor league goalie some pucks. Will be a shared affiliation regardless of who they end up with (which is perfectly ok).